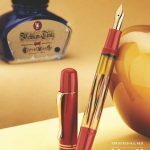 After the success of the models M101N brown tortoise and M101N Lizard, Pelikan presents the third version of this series: the M101N red turtle. The model comes in a precious package “historic” containing a bottle of ink royal blue: a wanted gift for any lover of fine pens. The stem is made of cellulose acetate in the characteristic Pelikan with a very particular process that generates different shades for each pen: the result is the creation of a unique masterpiece. The dark red parts are manufactured with high quality resin that keeps unchanged its luster over time. You can choose the 14-carat gold nib in four sizes: EF, F, M and B. The gift set will be available only in limited quantities, from September 2014.